A mantra is a way to go within your being by the vibration of sound, opening, and connecting to your true self. The use of a mantra in your yoga practice sets your intention with strength and power. The utilization of mantras has grown in popularity as the popularity of meditation has grown as well. Mantras are a way of meditating, and meditation itself has several benefits when it is practiced regularly. Some of the changes in the brain that occur boost health and wellness, longevity, improve resilience, focus, and increased amount of gray matter that are related to memory and emotional processing. There is no doubt that meditation is powerful, and mantra meditation is just as powerful. The use of a mantra can set a specific intention in your mind and as the mantra is used, then the mind can quiet outside thoughts, and deepen your practice. A mantra is a word, phrase, or sound that is used to foster certain intention with the repetition of the mantra either out loud or in your head. It is a method of meditation, as it requires focused attention. Swami Rama, the founder of the Himalayan Institute, states that in the tradition of meditation, the ancient teachings said that mantra and meditation are like “two sides of the same coin,” going hand in hand. The word mantra itself comes from two Sanskrit words, manas (mind) and tra (tool). Mantra is a tool to help quiet your mind, focus attention, and be immersed in meditation and the deep state of our being. One reason why mantra meditation can be so beneficial is that it gives you something to focus on. Meditation can become difficult if you are one that is easy to daydream or have thoughts wander far off (I know I am). The letting go of thoughts will happen to everyone and that does become easier with practice. Just like playing the piano or exercising, you must practice regularly for the results and improvement to show. So, with a mantra as a focus point of repetition, you are working on training your brain to improve its attention on a specific point and also bring in more of the energy associated with the mantra. Today there are hundreds of mantras out there, in different languages, that are modern words, phrases, and also and traditional sounds recorded with the tradition of yoga and meditation. The first recorded mantras were actually not words in any language, but the sounds that were obtained during deep states of meditation. They are universal sounds… such as “om” (sound familiar?). “Om” is commonly chanted at the start of a practice and also at the end. It is the universal sound of the common vibration of all living things. The chanting of “om” in a practice is intended to calm the mind, ground your being, and connect with the universe. Practicing with a mantra can be done a few different ways. It can be done by chanting or singing with a group, known as kirtan. Or on your own either said out loud or silently in your head. Another technique includes a string of beads that are known as mala beads. The string has 108 beads specifically and is used for the practitioner to move through each bead with their fingers, repeating their mantra with each bead. This method is called japa. The use of japa mantra meditation has been shown to slow down breathing, increase overall well-being states, and assist in keeping a focused mind. Here is a list of 15 mantras that can be used with your yoga practice to instill a powerful and connected yoga practice. Some are in Sanskrit, the ancient language of yoga, that have been used for thousands of years. The traditions of these mantras have the power also to connect with the people that have been practicing the tradition for years and years before us and with us all over the world. Some of the mantras are written here in English that have become more modern mantras, but also can evoke great depth, connection, and power towards yourself and your interaction with the world. This is a mantra to remove obstacles. Ganesh is an elephant faced God, the remover of obstacles. This mantra wakes up the root chakra and helps to deepen your connection with home to stay grounded and free from obstacles along your path. May there always be good fortune for all living beings. May all the inhabitants of the world be full of happiness. The more literal translation is above. To me, more simply put, “may all beings be happy and free” represents the meaning of this mantra. It signifies all beings of the world, equally, sending thoughts of love and compassion to all. This mantra is a seed mantra that is used in the Kundalini practice of yoga as a way of greeting and in chants during the practice. It means that there is only one constant, and you are connected and integrated with the divine. Use of this mantra, which is short but potent, cultivates a deeper faith and knowing of who you really are. In regards to the literal translation, the truth being your name means that you are in touch with your true self, and you are being true to who you are. It reinforces the true creature with ourselves and the true consciousness within everyone. Sun, Moon, Earth, Infinity, All that is in infinity, I am Thee. This is a powerful healing mantra. It is used to pray for healing for our friends, family, and ourselves. I bow to the creative energy of the infinite. I bow to the Divine channel of wisdom. This mantra is used to tune in to the divine, true power within ourselves. It connects us to the divine flow and awareness within ourselves, and to the same truth within our teachers. This mantra is a reflection of the sound of the breath. “Hum” is translated to “that,” referring to that of all creation, that gives us breath. O salutations to the auspicious one! Clearing of the destructive self and purifies for the true self. This mantra represents bowing to your inner self. It acknowledges and bows to your true self and heightens the connection to the divine and true nature within each of us. This Tibetan buddhist mantra is about wish fulfillment, emergency healing, protection, facing fears, compassion, enlightenment, and transformation. This mantra is about contentment and accepting life. Allowing what may come, come. This mantra represents accepting what each day brings, and feeling peace with what is. This mantra is about connecting to the world and higher, stating your presence within the universe of all. This mantra is about connecting with the feeling and power of love within, strengthening, and deepening. This mantra states that you are peace will instill peace within you. The continual use of this mantra will deepen and increase this peace within you. This mantra is about empowering, strong, and stating your greatness and power. Through repetition of this mantra, your sense of power that is within you elevates. This mantra is about bringing mindfulness to where you are in time and space, being fully present, and connecting to the current moment. This list is just some of the many mantras that can be powerful for you. I have found that using any mantra with “I am…” and filling in the blank with something that is needed more of in that day is wonderful. You can fill in the blank with just about anything to bring you in deeper awareness of your own being (I am …. Abundant, at peace, grateful, thriving, love, compassion, one, etc…). As you explore and connect with mantras that find deep meaning for you, you may begin to find your mantra or mantras. The one mantra that you can turn to at any moment for grounding, your go-to mantra. The way that mantra can have to be the sounds that you allow to vibrate within your being brings such great power to mantra to benefit you. If you can think of times in a yoga class where there was a mantra, chat, or the sound of “om” at the beginning or end of the class – then think of the feeling of the vibration from your voice and the voices around you. When the universal sound of “om” is said, the presence, depth of those around you, and your connection to the universe states your power. It brings in the authenticity of your being and your inner self to grow and live with your true core values and self. Incorporation of mantras within your yoga and meditation practice can bring your being to a state of stillness and peace as the words and sounds grow stronger in repetition, yet bring more silence of the mind. 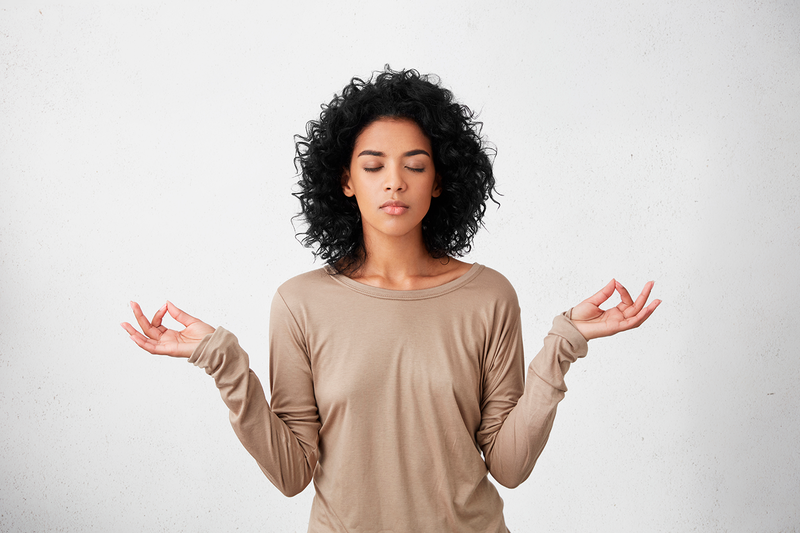 When you bring your attention to a focused intention with a mantra, it strengthens the neurological connections in your brain associated with that intention. Which, can create more abundance of the positive intention and also clear out negative energies/thoughts that don’t serve you.